The town of Zamosc (also known as Zamostie, Zamotch, Zamoshtch), located in the Lublin province of eastern Poland, was established at the end of the 16th century on the grounds of a former village by Jan Zamoyski (1542-1605), a Polish statesman, general, and grand crown chancellor of Poland during the reign of Stephen Bathory (1576-1587). Jan Zamoyski, who was educated in Italy, was instrumental in introducing into Poland humanist ideas reflected in his policies at both the national and the local level. Zamosc, sometimes labeled “Padua of the East”, was designed by the Italian architect Bernardo Morando (1540-1600), a native of Padua, according to the principles of “Citta ideale” (“Ideal city”) and it represents the only complete Renaissance urban complex in Poland. In accordance with his enlightened policies and his tolerant attitude, Jan Zamoyski invited new settlers to his town that included in addition to Poles, people from other nationalities and non-Catholic denominations: Armenians, Greeks, Italians, Hungarians, Scots, and Jews. This policy helped in strengthening the economic and cultural life of Zamosc and creating an island of tolerance at an epoch when other Catholic countries in Europe persecuted the Jews and the Protestants. The first Jews settled in Zamosc in 1588, eight years after the founding of the town. They were Sephardim (Spanish Jews) coming from the Ottoman Empire and Venice and, consequently established the northernmost Sephardi community in Eastern Europe. They were granted equal rights that included tax exemption for 25 years and the right to establish their own community on condition they accept into their community only Jews of Spanish and Portuguese descent. The extensive privileges accorded to Jews included the right to own houses, to build a brick synagogue and a Mikveh (ritual bath), and to establish a cemetery. On the occupational level, they were free to engage in most activities, with the exception of shoemaking, furriery, and pottery. The Jewish quarter was located around Rynak Solny (The Salt Market), Ulica Zydowska (The Jewish Street) (now Ulica Zamenhofa), and Ulica Pereca, in the northeastern section of the town center. A newer Jewish district evolved in the early 19th century in the area stretching from Stara Brama Lwowska towards Nowa Osada. The original Sephardi community ceased to exist in the 1620’s following an economic crisis generated by the accumulation of bad debts by Polish debtors. Having been attracted by the commercial importance of the town, Ashkenazi Jews also began settling in Zamosc at the beginning of the 17th century. The influx of Ashkenazi Jews increased in the 1640’s, especially by refugees fleeing the anti-Jewish massacres perpetrated by the troops of B. Chmelniecki during the Ukrainian revolt against Polish rule. Although Zamosc resisted the siege, many Jews died because of famine and diseases. The Jews were requested to pay taxes according to a system introduced in the second half of the 16th century by the resolutions of the Sejm, a system that largely remained valid until the beginning of the 19th century. There were taxes for the local landlord, the town authorities, and a regular Jewish poll tax for the benefit of the state. The many wars fought by Poland in the 17th century brought about a massive increase in the amount of the poll tax, which by the end of the 17th century was almost ten times higher than one hundred years earlier. At the same time, the legal status of the Jews deteriorated with new restrictions imposed on their residential rights in Zamosc. The prohibition of buying houses within the walls of the town created a situation of fictitious ownership of realty, with some Jews trying to conceal their properties. In 1765, however, the Jewish population of Zamosc and its surrounding communities numbered 1,905 individuals. While the Sephardi Jews were active in the finance, some of the later Jewish inhabitants of Zamosc established small commercial enterprises that dealt in timber, grain, and cattle. Others were artisans; mainly tailors, locksmiths, tinsmiths, and carpenters. In addition, there were Jews who rented out plots of land. A special permit granted by the landlord Michal Zdzislaw Zamoyski in 1726, confirmed earlier privileges of engaging in the production and selling of alcoholic beverages enacted on special conditions already in 1631. The Jews were granted the right to slaughter cattle and sell kosher and non-kosher meat from a separate place in public booths without any hindrance by the butchers’ guild. 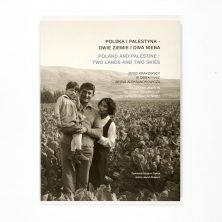 During the last years of the independent Kingdom of Poland at the end of the 18th century, eighteen Jewish families left Zamosc, because of the efforts of the Polish authorities that encouraged Jews to be active in agriculture, and moved to villages in its vicinity. The beginning of the industry in the early 19th century, brought about a number of small plants, established by Jews, who employed other Jews. In 1846-7 these included a winery, three brickworks, three flourmills, a soap factory and a few sawmills. Following the divisions of Poland during the late 18th century, Zamosc was occupied by the Austrians from 1772 to 1809, when it was included into the newly set Grand Duchy of Warsaw following the military campaigns of the Napoleonic wars that caused severe destructions to Zamosc. In the wake of the Congress of Vienna in 1815, Zamosc and its surrounding area was occupied by the Russians and as part of the Kingdom of Congress Poland remained under Russian rule until WW1. The Russian regime was less favorable towards the Jews. The governor of Zamosc, in 1830, even considered expelling the entire Jewish community from the town as a punishment for their refusal to conduct a census of the local Jews. Jews were prohibited from entering the town for a number of years during the 1830’s. In 1845, new taxes were introduced for the right of wearing traditional Jewish garbs. During the Polish insurgencies of 1830 and 1863, many Jews of Zamosc sided with the Poles. In 1870, eight local Jews were accused of robbing the local Russian military camp; they were released from a possible death penalty only after the intervention of foreign Jewish personalities and the Alliance Israélite Universelle of France. The Jewish population of Zamosc grew from 2,490 in 1856 to 7,034 in 1897, and to 9,000 in 1909, representing about 50% and 63% of the total population of the town, respectively. The first wooden synagogue in Zamosc was built at the end of the 16th century when also a Jewish cemetery was opened. The impressive Renaissance style synagogue was built in the 1610’s. The Jewish community of Zamosc extended its authority over a number of small communities in the surrounding countryside: Laszczow, Bilgoraj, Frampol, Krasnobrod, Zolkiewka, Wysokie, and Modliborzyce. 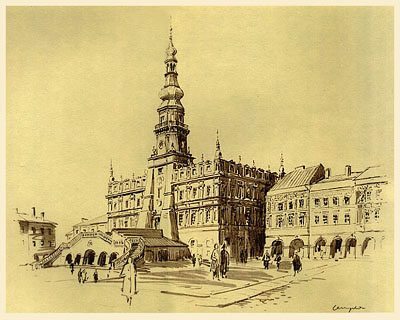 In 1677, the Jews of Zamosc belonged to the Chelm-Belz area of the Council of the Four Lands, but only three years later the Jewish community of Zamosc and the surrounding area became a separate entity, to be recognized officially in 1730. At times, it has still been referred as belonging to the district of Chelm-Belz. During the 17th and 18th century Zamosc became known for its scholars, starting with R. Shlomo, the first rabbi in the town. He was followed by a long series of sages, among them R. Aryeh Leib (17th century), author of Sheagat Aryeh who later moved to Tykocin and then traveled as an emissary to the Ottoman Empire to meet the false messiah Shabbetai Zvi; R. Jacob Isaac Hochgelertner (1710-1771), founder of the Yeshivat Hahmei Zamosc, headed after him by his son R. Joseph Hochgelertner (1740-1807), author of Hiddushei Mahari and Mishnat Hahamim, and his grandson, R. Jacob Isaac Hochgelertner (1771-1825), author of Zikhron Yitzhak. Among the adepts of the Kabbalah in Zamosc, a special mention should be made of R. Baal Shem Harishon, son-in-law of R. Uri and grandson of R. Joel Baal Shem of Zamosc as well as R. Avraham bar David, R. David Hakohen, and R. Yehuda Leib Edel (d.1805), author of Afikei Yehuda. The dispute between R. Jonathan Eybeschutz (1690/4-1764) and R. Jakob Emden (1697-1776) in the middle years of the 18th century had not passed over Zamosc where the local rabbi, R. Avraham Hakohen, supported Jakob Emden in spite of the general preference in favor of Jonathan Eybeschutz as indicated by the Council of the Four Lands. The messianic ideas of Sabbateanism and later those of the Frankists had received little response in Zamosc. The Hassidic movement had a bigger success in the smaller rural communities around Zamosc. Only towards the middle of the 19th century did the number of Hassidim become important with the majority split between followers of the rabbis of Belz and Gur. The religious life of the community in the 19th century and early 20th was greatly influenced by a series of town rabbis, among them R. Moshe Jehoshua Heshel Wahl (d.1873), author of Beth Moshe and uncle of I. L. Peretz, and R. Josef Shlomo Shabbtai Halevi Horowitz (1861-1943), a descendant of the of Jacob Isaac Ha-Hozeh Mi-Lublin (1745-1815), who served as rabbi in Zamosc from 1889-1928, and R. Mordechai Halevi Horowitz-Sternfeld (murdered in September 1939 by Polish anti-Semites), the rabbi of the new district of the town. Austrian rule at the end of the 18th century facilitated the introduction of the enlightenment movement to Zamosc. The new ideas were welcomed by numerous Jews, among them Joseph Zederbaum (the father of Alexander Zederbaum, editor of the Hebrew newspaper Ha-Melitz), and the scholar and educator Jacob Eichenbaum (1796-1861) both of whom became leaders of the local Haskalah. The Austrian influence brought about the establishment of Jewish-German schools. In the 19th century the Jews of Zamosc organized large efforts for the advancement of the local education. Jewish children continued to attend the traditional heder and the Talmud Torah, with some continuing to yeshiva. In 1886, the local intelligentsia set up a Jewish school for boys whose curriculum included such subjects as Russian and Mathematics. Other Jewish children were sent to the State Gymnasium (high school) as well as to a private secondary school. Towards the end of the 19th century, there was an increase in the number of Jewish students in institutions of higher learning. Other activities of the Jewish community were directed to the assistance of the needy. The health care services received an impetus with the opening of Bikur Holim in the second half of the 19th century; and in 1911 of Linat Zedek, a small clinic that eventually evolved into a hospital with 24 beds. The community also operated a kosher canteen for Jewish soldiers of the local Russian army garrison, a senior citizen home, and mutual help fund that extended interest-free loans to Jewish merchants and artisans. 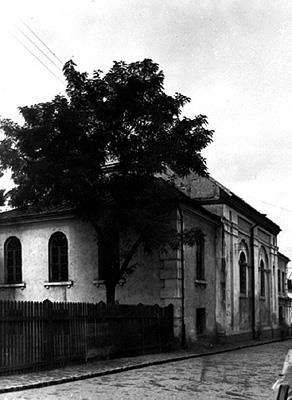 A second synagogue was built in the Nowa Osada district in 1872 and extended from 1909 to 1913. The increasingly political repression of the Czarist regime during the last decades of the 19th century and in the early 20th century had a double effect: there was in increase, on one hand, in the number of Jews who emigrated, mainly to the USA, and it brought about, on the other hand, a considerable growth in the political involvement of the Jews of Zamosc with many joining the Bund – the Jewish Socialist party whose local branch opened in 1903, and the Zionist Socialist party Poalei Zion. The Russian revolution of 1905 was welcome by Jewish workers in Zamosc who demanded an improvement of their working conditions. The repression that followed included many arrests and even deportations to Siberia. At the start of WW1 Zamosc was occupied for a short period of time by the Austro-Hungarian army in September 1914. When the Russian army recaptured Zamosc, the local Jews of were accused of siding with the Austrians and consequently the Russians executed 11 Jews. The Austro-Hungarian army reentered in 1915 and held Zamosc under its occupation until the end of WW1. Numerous inhabitants left the town because of the fighting, others died in a typhus epidemics that erupted in 1916. Since the end of 1918, Zamosc has been part of the Polish Republic. In the period between the two World Wars, and even with a continuing emigration that was strong particularly among the young, there had been a significant increase of the Jewish population from 9,383 in 1921 to about 12,000 at the beginning of WW2, which represented about 45% of the total population. Both WW1 and the war between Poland and Soviet Russia had grave consequences on the Jews of Zamosc. The economic activity could be reorganized only in the early 1920’s. The standards of living again, however, started to decline because of the Great Depression that hit hard the Polish economy and of the anti-Jewish policies of the Polish government. Many local Jews received assistance from the community through the Provident Fund which itself was subsidized by the Joint Jewish Appeal. Most of the local Jews were employed in small business and a promising industry that provided for the needs of the Polish countryside. There were Jewish trade unions that defended the rights of Jewish bakers, salesmen, transport and timber workers, as well as a merchants’ association and a union of religious artisans founded in the early 1930’s. Zionist activity in Zamosc intensified during the Austrian occupation of Zamosc in WW1 when a branch of Mizrachi opened in 1916, followed next year by a Zionist conference attended by delegates from other towns in the region. Zionism strengthened during the 1920’s with almost all the main Zionist parties attracting supporters from amongst the Jews of Zamosc. 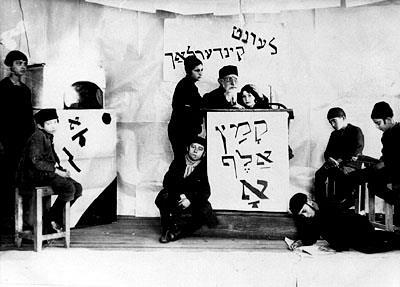 Zionist youth movements included Tze’irei Mizrachi (1918), Hashomer Hatzair (1919), Freiheit (= Dror, 1929), Beitar (1929), Hanoar Hazioni (19129), and Gordonia (1931). The agricultural training of aspirating emigrants to Eretz Israel was undertaken at Avigdoria, a farm belonging to the Hechalutz movement established on the land belonging to the local Zionist activist Avigdor Ilander. Brith Hahayal and Brith Yeshuron attracted members of the Revisionist and the Religious Revisionist Zionist movements, respectively. A number of Jews from Zamosc emigrated to Eretz Israel during the interwar period. The Zionist movement encouraged and sponsored Jewish sports clubs in Zamosc: Maccabi (from 1912), Nordiya (1932), and Hapoel. Jewish political parties active in Zamosc included the General Zionists, Socialist Zionists, Poalei Zion, Mizrachi, and the Revisionists. In addition to the Zionist group that was dominated by the Socialists – they received an absolute majority at the last elections held just before the outbreak of WW2, other political parties included Agudat Israel, a religious conservative party, the Bund which along with its youth movement Tsukunft (Future) controlled much of the local trade unions, and a small group of Communists that activated illegally. All political parties had representatives in the Community Council, the leading administrative body of the local Jewish community. The community was instrumental in assisting the poorer families, particularly during the years of the economic crisis. The community administrated an orphanage, the Jewish hospital, and the health organization TOZ. Jews were elected to the Town Council of Zamosc. In 1928 half of its 24 members were Jewish, but in 1929 their number declined to six only (a quarter of the total), and remained unchanged in 1939, when the last elections were held. The general attitude towards the Jews worsened during the 1930’s because of the growing anti-Semitism in Poland. In Zamosc it was expressed by boycotts of the Jewish business as well as by violent attacks against Jews and their property. The cultural life of the town was enriched by a number of public libraries. The first was the I. L. Peretz library opened already in 1912, with books mainly in Yiddish, that attracted readers from among the members of the Bund. This library knew a number of vicissitudes: about 5,000 books were destroyed when the Polish police stormed the locals in 1923. Its activity was renewed in 1926 only to be closed again by the authorities in 1931 under the accusation of sheltering Communist activities. Finally the library opened again in 1932 and functioned until the Holocaust. The David Frishman Hebrew library started its activity in 1922 serving as a cultural centre for the Zionist youth of Zamosc. There were another two public libraries in Zamosc: the Solomon Ettinger library with books in Yiddish, Polish and Russian, and a smaller library owned by the trade unions. The libraries served as meeting places for a number of literary circles, conferences, amateur theater, and an orchestra. Zamoshtisher Shtime (Voice of Zamosc), a Yiddish language periodical of Poalei Zion was published from 1928 to 1939. Other Jewish periodicals in Zamosc included Zamoshtisher Vort (Word of Zamosc, from 1930), published by Agudat Israel, Habe’er (The Well, from 1923), and Unser Geist (Our Spirit), the last two dedicated to religious issues. Dr. Philip Lubelski, physician. He was an army surgeon in the Polish legion of General Jan Henryk Dombrowski (1755-1818) in France and later in the French army during the Napoleonic campaigns, he was made on Officer of the Légion d’Honneur. Lubelski was chief physician of the military hospital in Zamosc until 1826, when he moved to Warsaw. Arieh Loeb Kinderfreund, scholar, born in Zamosc. He lived much of his life in Galicia, in deep poverty. He is the author of Shirim Shonim (1834), a collection of poems, and of various other works, including a Latin essay about the priority of the Hebrew language and a separate apologetic treatise in defense of Judaism. Yaakov ben Seeb (Wolf) Kranz, preacher (Maggid), known as the Maggid of Dubno. Alexander Zederbaum (pseudonym Erez, the Hebrew for Ceder = Zederbaum), pioneer of Jewish journalism, born in Zamosc, he settled in Odessa in 1840 where he published Ha-Melitz, the first Hebrew weekly in Russia (1860), later moved to St. Petersburg, an enthusiastic supporter of Hibbat Zion movement. Isaac Leibush Peretz, Yiddish author, born in Zamosc, he is widely acclaimed as one of the three major writers of the modern Yiddish literature. Mordechai Strigler, Yiddish writer and editor of the Forward (1987-1998). 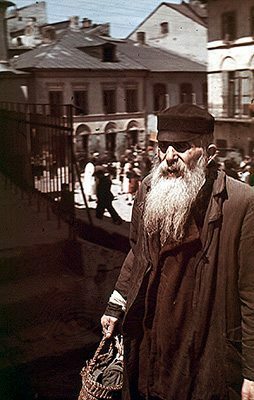 Born in Zamosc, and ordained a rabbi in 1937, he turned into a writer after WW2 and published a six-volume series Oysgebrente Likht (Extinguished Candles) about the Holocaust, and Arm in Arm with the Wind (1955), a historical novel about Jewish life in Poland during the 17th and 18th centuries. Strigler was awarded the Itzik Manger Prize in Yiddish Literature (1978). The German army occupied Zamosc on September 14th, 1939. The heavy German air raids claimed hundreds of victims from the local Jewish population as well as from large numbers of Jewish refugees from western regions of Poland who sought shelter in Zamosc. The occupying German forces and local anti-Semites seized the occasion for looting Jewish property and murdering Jewish inhabitants. In late September 1939, Zamosc was occupied for two weeks by the Soviet army. When it retreated, an estimated 5,000 Jews left Zamosc for the Soviet Union. In October 1939, the Germans established a Judenrat and forced the Jews to pay a “contribution” of 100,000 zlotys and to provide daily 250 Jews for hard work, a quota that later increased to 500 and 600 Jews. The Jewish population of Zamosc at the time was 4,984, according to a census conducted by the Judenrat. In December 1939 the Germans expelled 500 of Jews from Lodz, Kalo, and Wloclawek and resettled them in Zamosc. The Judenrat housed these refugees in the homes of the Jews who fled to the Soviet Union. The Germans killed 150 old persons and children of this group after a short period of time. The persecutions only increased in 1940, with the introduction of the compulsory wearing of an armband with a yellow Star of David and many other restrictions of movement, occupations, food supplies. The number of forced workers grew and hundreds were sent to other locations in the Lublin region. 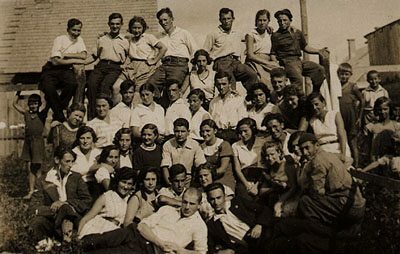 In 1941 an estimated 1,500 to 2,000 Jews from Zamosc were sent to the newly established labor camp at the nearby Izbica. By May 1, 1941, all Jews in Zamosc, estimated at about 7,000, were forced to move to an open ghetto in the new district of the town around the Hrubieszowska street. The office of the Judenrat was set in the building of the synagogue of the new town. The situation inside the ghetto worsened with the outbreak of a typhus epidemic during the winter of 1941-1942. The mass deportations from Zamosc began on the eve of Passover, April 11, 1942. The entire Jewish population was gathered in the market place and gun fired with 89 killed on the spot and another 150 shot dead by the Germans on the way to the train station. About 3,000 Jews were deported immediately to the Belzec death camp. The remaining 2,000 Jews were joined on April 20th, 1942 by 2,100 Jewish deportees from Czechoslovakia and Germany. A second deportation took place on May 27, when about 2,100 Jews were sent to Belzec and murdered. During the summer of 1942 almost 1,000 Jews were sent to death camps in a number of smaller deportations. The third mass deportation occurred on October 16, 1942, when again the Jewish population was gathered in the market place and then taken to Izbica, then to Belzec and Sobibor and murdered. Several hundred Jews who managed to hide in prepared shelters were later discovered and arrested with the help of local Polish firemen. After being held for eight days without food and water, the survivors were executed in the Jewish cemetery. By March 1943 all Jews left in the ghetto of Zamosc were killed by the Germans and in May 1943 the last about 1,000 Jews from Zamosc from forced labor camps around Zamosc were deported and killed in Majdanek. During these years hundreds of Jews fled to the forests where some joined local or Soviet partisan groups operating from the Polesie forests. 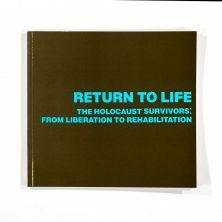 After Zamosc was liberated by the Soviet army, the first 12 Jewish survivors returned to the town. They were joined by about 300 persons who returned from the Soviet Union. The local Polish population met them with hostility and even violence that brought about the death in 1945 of two Jews at the hands of local anti-Semites. Most Jews departed from Zamosc after a short period of time and in 1947 there were left only five Jews in the town. The Dawna synagogue was restored after the war and again during the 1960’s, and turned into a public library since 1958. In the early 2000’s there were plans to evacuate the library and renovate the historic building. The building of the new synagogue is located at 32 Gmina Street. It was converted into a kindergarten in 1948. The site of the old Jewish cemetery from the 17th century is now occupied by a house of culture. In the new cemetery in Prosta street a memorial to the Jewish victims of the Holocaust from Zamosc was set up in 1950. It was made of remains of matzevot (gravestones) and bears the inscription “Thou shalt not kill”. The first synagogue in Zamosc was built in the 1590’s as a wooden structure. The building of a brick edifice in accordance with the privileges granted to the local Jewish community was undertaken after 1610 and continued for eight years. The Dawna (“Old”) synagogue is a prominent example of late Renaissance Polish style in harmony with the general urban design of the old town of Zamosc. The exterior walls have been extended to conceal the roof giving the building a general aspect of a fortress. The prayer hall (11,6 x 12,2 m.) represents the core of the building; the women’s prayer rooms were added towards the middle of the 17th century. Similar to that found in other Polish synagogues, the floor was lowered in order to increase the height of the interior. The walls were decorated with rich paintings in vermilion stuccoes with floral motives including a stylized tree of life, crowns, rosettes, and Hebrew inscriptions. During the 18th century, a modest entrance hall was added on the west side of the prayer hall, while the attic was disregarded. The synagogue was renovated in the second half of the 19th century when the building received a new roof and an attic. At the same time a second floor was built over the original women’s prayer rooms. During the Holocaust the building suffered major damage, especially of the northern parts that were destroyed by the Germans. The synagogue was vandalized and looted, and then used as a stable. It was rebuilt, following WW2, in 1948-1950 and since 1958 the building has served as a library. A second restoration of the building was conducted during 1967-1972. Some traces of the synagogue’s former splendor can be discerned inside the building. The place of the Aron Ha-Kodesh is evident on the eastern wall. The niche that sheltered the Torah scrolls is decorated with motives of vessels – symbol of Levites, and crown of Torah. The iron octagonal bimah with a Torah crown was located at the center of the prayer hall and was a gift by Shmuel Barzel, 1787. The prayer hall also boasted a number of majestic menorahs. 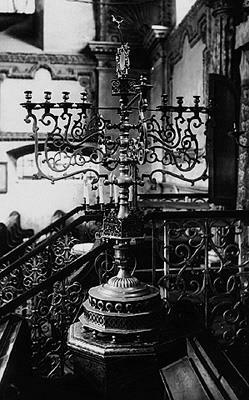 Today there are no remains either of the bimah or the candelabra. Next to the building of the synagogue is the former office of the community, dating from the 18th century with additions from the 19th century, and the heder. The 18th century building of the former mikve, renovated in the 19th century, is located in the cellars at Ul. Zamenhofa 3.